All week I left the two broken fish tiles sitting on the graphite near my torch. Every time I saw them I felt a pang of loss. I kept thinking about how to salvage them. Then two things went together in my head -- inspiration!! 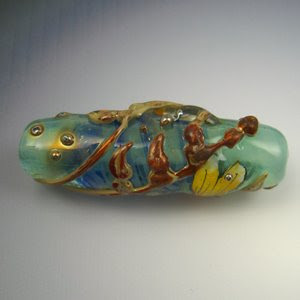 Leaf patterns are pretty ubiquitous in the glass bead world. I've been practicing my stringer work leaves with what I call my kelp pattern. 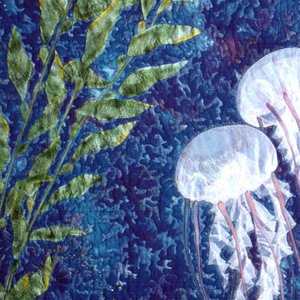 That stems from one of my earliest art quilts, Going with the Flow, which has beautiful silk kelp and jellyfish. The kelp leaves have a float at the base of each one, so that's the way I do the leaves -- a stem with attached dots for floats and then long upward leaves. Yesterday, I decided to wrap the broken tiles onto the bead anyway, try to attach the second part as best I could, then cover the break with kelp. 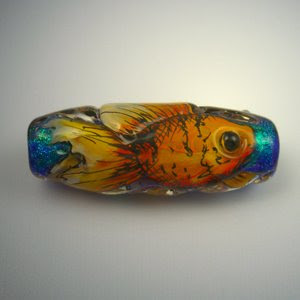 Along the way I remembered this idea I had about surface sculpting the beads to give more dimension to the fish. See the trail where the kelp winds around? That's where the crack was. It also masks nicely the back of the bead where the tile comes together, especially in the beads where I use dichro sheet underneath, because it leaves a noticeable line. 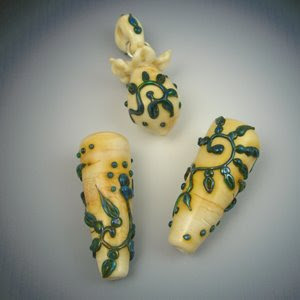 I am so in love with these -- so much more enchanting than the plain, flat fish. I'll never go back!!! I guess I should wish for more mistakes. Which do you like better -- the plain, flat fish or the sculpted fish? They're both really beautiful! What a great brainstorm. Lucky you to have had such a disaster turn into such a treasure. I love the added dimension. How absolutely stunning!!! Both ways! I like the sculpted one the best. 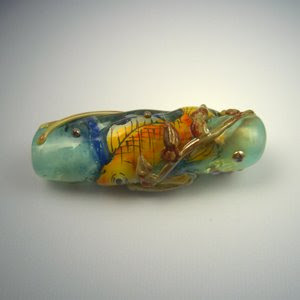 I love beads that has just a bit of texture. The one with the kelp is very nice too, and with the kelp texture doesn't need to be sculpted further I think.